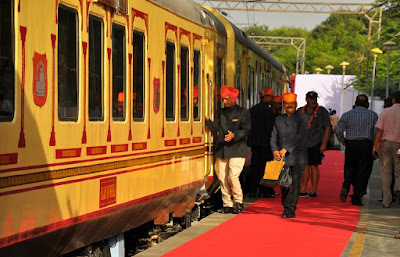 Palace one of the luxurious train you must travel once in your life span. The journey started from New Delhi and will covers almost 8 cities with a wonderful experience of journey. There is amazing services and royal treatment with all comforts like a royal family. 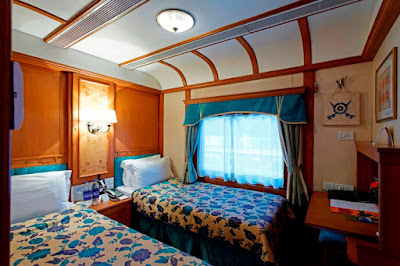 The entire interior of cabin is furnished with wood and to experience the comfort silk and velvet bed sheets with pillows. Personal attendants for each cabin and tastiest food you can enjoy continental, south Indian, Punjabi, Rajasthani and many more. The best part of your journey is the bar which has almost all the brands in drinks like vodka, whisky, brandy, cognac, port wine and many more. So sure you will love to enjoy in your journey. 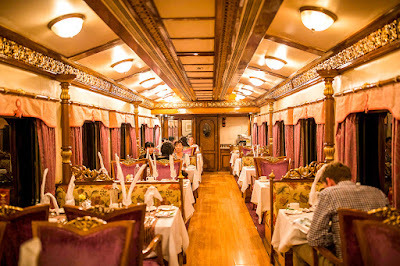 To experience a royal and luxurious journey on a train trip we have Maharaja’s express with amazing wooden worked suites and all royal facilities to explore. The shiny and lustrous wooden flooring with modern and spacious deluxe suites including all modern technologies with tremendous privacy and comforts. It covers the tourists’ attractions in North-West and Central India. The Kitchen area is featured with all the cuisines of North Indian, South Indian, Continental Chinese and other traditional eatables. 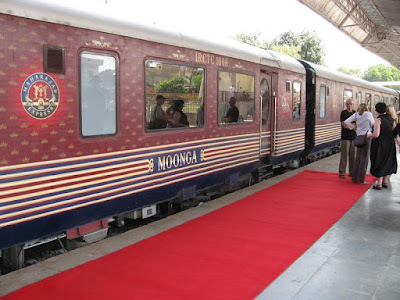 The bathrooms are accomplished with all the modern facilities of Maharajas Express like hot water, cold water, shower system and all other facilities. In a royal suite there is a separate bar where you can found all the beverages including wines, spirits, beers, snacks and almost all the drinks that can be served by IMFL (Indian Manufactured Foreign Liquor). The immense beauty of this train can be experiences on the routes covering the destination in Karnataka, Kerala, Pondicherry, Goa and Kerala. The train is facilitated will all the latest features including Gym, conference and restaurants. Tourists can splendor out around 7 nights and 8 days on this journey and cover the beautiful destinations to make your trip memorable. You will get centralized air-conditioned suite with cuisines from well reputed restaurants. You will get a chance to taste the lip-smacking varieties of eatables (veg- non-veg) and other traditional foods. The inbuilt bar in your suite has the finest collections of soft and hard drinks you can enjoy as per your choice. An initiative by the Maharashtra government to promote the Maharashtra tourism by launching the Deccan Odyssey. The tremendous facilities which you must enjoy include the indoor games, internet, newspapers, magazines, royal spa and many more. The best Royal services you can enjoy on your journey, its same like a stay in a five star hotel. There are 2 restaurants to serve you the tastiest food of almost all the traditional and the other varieties including Italian, Chinese, continental and other as per your requirements. You can take a brief description from the menu to select. The liquors available in your cabin are the best selected one; you can try beer, cocktails, rum, whisky or any other with a variety of snacks. 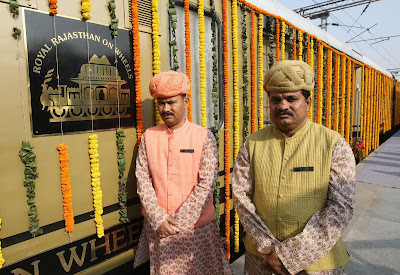 A beautiful journey in train with the comforts and facilities of Rajasthani royal lifestyle of kings. The cabins are well furnished with the best quality interiors and the finest infrastructure. The bed spreads and the sofas are manufactured with the velvet and satin to give a royal look and shiny and clean bathrooms with modern facilities of shower and interiors are really awesome. The 24* 7 facility of attendants for any need, all varieties of food and liquors makes your journey more lovable. You must try this beautiful journey of royalty in your life span.